Show your wild side as you celebrate a jungle theme party with these fun Zebra Large Plates. The Zebra Large Plates are perfect size to use as the main plate at a buffet table. 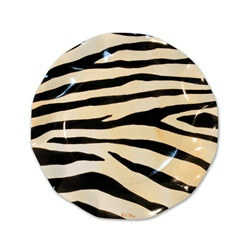 The Zebra Large Plates are perfect for the main course of a meal. The Zebra Large Plates are designer scalloped paper plate, which will make clean up easy. The Zebra Large Plates have a splotchy tan background with black Zebra print. The Zebra Large Plates come in a package of ten (10) fun Zebra plates. Be sure to also include the Zebra Medium Plates for sweet desserts.